Thought I'd stop by with a layout today, although I should be doing plenty of other stuff......if I can keep my eyes open! I started watching the Oscars last night but kept having to pause the action for one thing or another - getting the kiddo's to bed etc, so all in all it was WAY past midnight when I finally finished viewing! 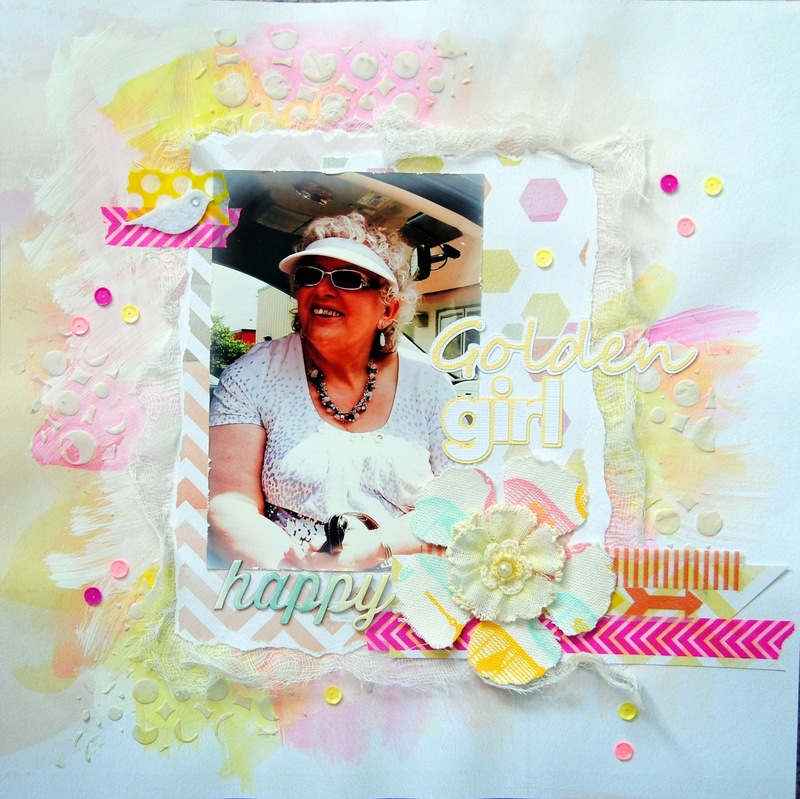 Anyhow, today's page is all about my Momma and a snapshot taken during their visit last Summer. She will probably smile over the title, or be getting ready to chew my ear out over the phone! During our Canadian Summers my Mom's head get's hot, so although she needs the shade, she doesn't like to wear a hat covering the top of her head. Hence the mission to find her a visor......... then everyone's happy! Consequently, it proved to be a great source of entertainment for us as you couldn't help but look at her without thinking she'd just stepped foot of the set of an episode of 'The Golden Girls'! Anyhow, as far as the page goes it's a little 'artsy' again, with a taste of mixed media. The paper collection is from Pink Paislee but I covered most of the background with a mixture of Gesso, watercolours and Molding Paste. There's also cheesecloth, Washi tape ( I have to thank Carola for the loan.....again!) and sequins in there. Now that should get us in the mood for Summer! This is gorgeous Jayne!! 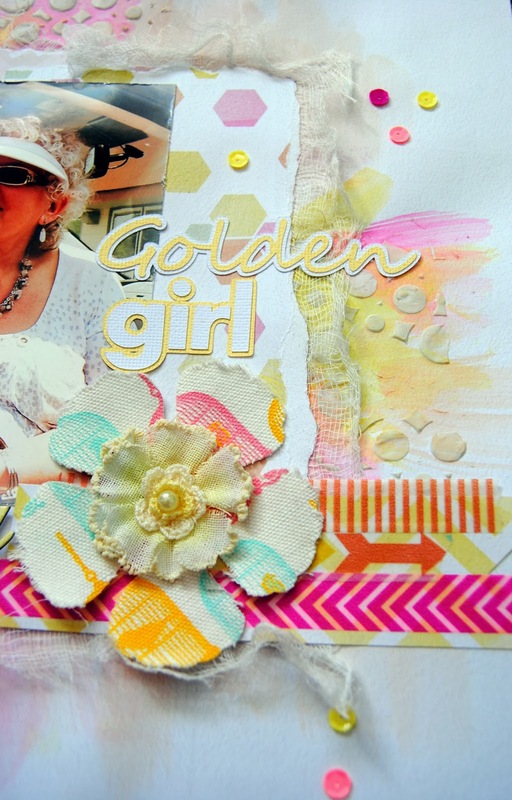 Loving all of the texture!! Who says you have snow???? Your Momma looks wonderful on this page! The spring colours are light and fluffy and make me long for the warmer weather...oh well, it will come. Great job with the many mediums you used! Gorgeous page! 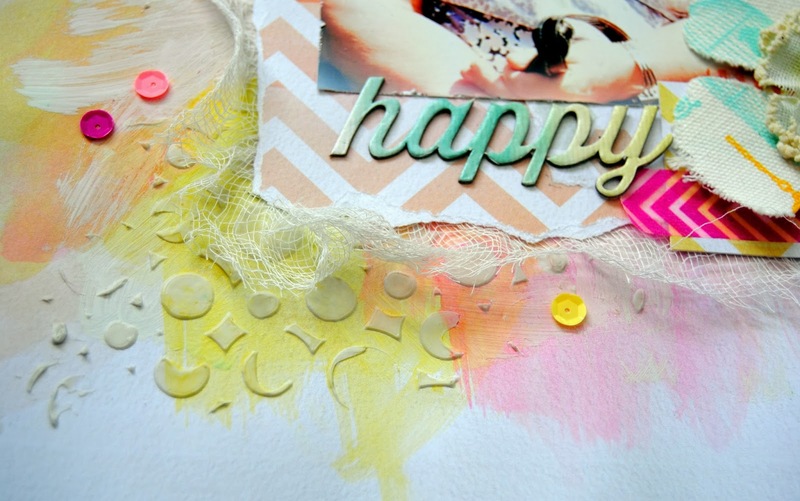 I love all the mixed media goodness on this layout and the bright, sunny colors!